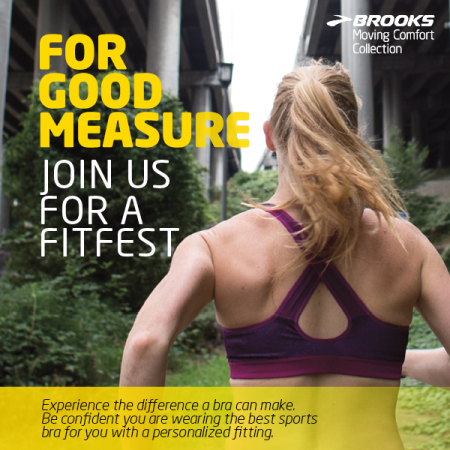 Join Fleet Feet Sports, Brooks Running and Crowned Girl Fitness for a Bra Fit "For Good Measure" Fit Fest! February 17th from 5-7pm at Crowned Girl Fitness located on Orchard in Vacaville. Bra fitting by our Brooks Running bra fit specialist. Specials on sports bras, special gifts and an all around fun event for our local fitness minded ladies. 8 out of 10 women are wearing the wrong size sports bra! Are you? No bra should celebrate a birthday! How old is yours? THE DIFFERENCE A BRA MAKES Women experience running a little differently. And at Brooks, every stitch sewn is engineered to support the unique needs and preferences of female runners everywhere. We are the #1 sports bra brand with runners—ensuring every woman is free to move with confidence.